It’s a little late in the year to be making such a comforting, wintry dish but sometimes an earthy casserole is what you want. 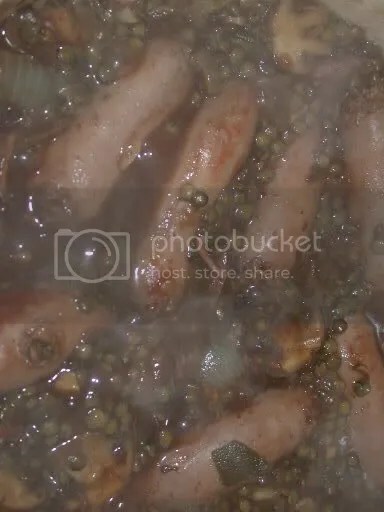 In a casserole dish, first fry the sausages until the skins are nice and brown (they don’t have to cooked through yet). This is to give them a good colour, otherwise if you just stick them in the casserole they’ll be a rather unappealing grey when they’re cooked. It’ll also leave burnt sausage bits on the bottom of the pan (this is a good thing). Set aside the sausage and with the heat on high chuck a small glass of water in the pan and scrape up all the burnt bits. When all scraped up, pour into a cup and set aside. Now soften the onion in the same pan with a little olive oil. When they’re looking soft, add the garlic, mushrooms and the sage leaves. Cook for another couple of minutes, then add in the rest of the ingredients, including the burnt-bits-liquid. Bring to the boil and simmer for about an hour, checking every 15/20 mins that it’s not dried up and adding more water if necessary. This wants me to eat it all up. 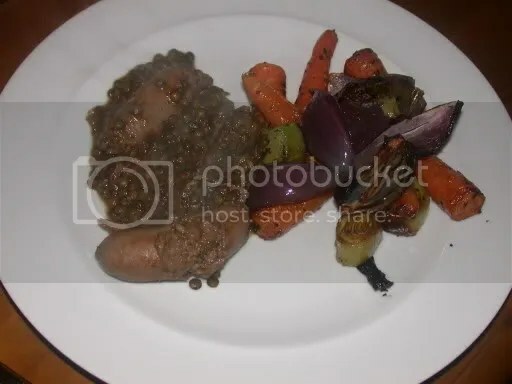 I make a similar dish in a crock pot, but instead of sausages the meat is ham. Delightful with some crusty bread. Sounds nice, but the photo with big hunks of sausage looks rather intimidating. Maybe cutting the sausage into smaller bits would be a good idea? I just made this. Used dried sage, and only had chicken stock in the cupboard, but it was really lovely. NVP off U75 here. Just wanted to say thanks for this recipe. Tried it tonight and it was absolutely delicious. Thanks. You can also make this using sun dried or ripened tomatoes and thyme instead of sage and it is delicious.Finish with a good squeeze of fresh lemon mmmmm perfect. Just looked the post! Good thread! Mill Valley Sheepskin & Leather Co. Please let me know if you’re looking for a article author for your weblog. You have some really good articles and I think I would be a good asset. If you ever want to take some of the load off, I’d absolutely love to write some articles for your blog in exchange for a link back to mine. Please shoot me an email if interested. Thanks!